A new study released earlier this week by Nature Communications shows that in recent years, hurricanes in the Atlantic have been strengthening more quickly than in previous decades, according to a study by a number of US hurricane experts. We saw that this past year with Hurricane Michael, which strengthened to a category 4 storm shortly before it made landfall in Florida. Hurricane Harvey in 2017 also strengthened just before landfall. In part the scientists attribute this to warmer sea surface temperatures caused by global warming, although other factors are also possible. You can read more from Weather.com here. 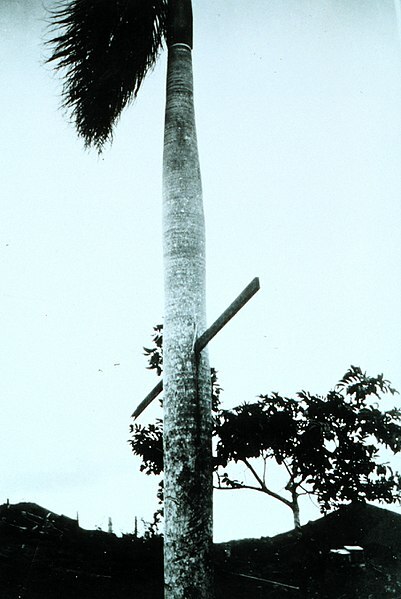 Hurricane winds drive a 10-foot 2×4 through a palm tree in Puerto Rico, 1928. Source: NOAA via Commons Wikimedia.